Wednesday saw the annual Seniors Open Turkey Shoot. Although the numbers were down on previous years there was still a healthy turnout of 37 teams. 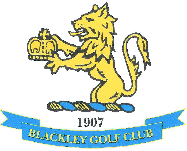 The winners with a 4 point lead over second place, Blackley duo Jim Ashelby and Dave Pickett with 47 points pushed John Jones and Jim Skelly from Antrobus and Pike Fold respectively with 43 points into the runner up slot. K Waywell and B Lillis from Pike Fold made up the top three with an excellent 41 points. A card play off was needed to sort out the next 7 palces. Thanks to all who supported and attended this event.